Picture a reclusive man, dripping sweat all night in a dark lab, illuminated only by crackling sparks that leap from enormous machines and cast a purple glow across his face. This is Nikola Tesla, the archetype of the mad scientist. His inventions fill the world around us; they are instrumental to our modern electrical grid. They are quiet, reliable, invisible machines. But, perhaps his most famous invention is the Tesla coil (see above photo), the contraption that produces beautiful flying arcs of electrical energy. How does that thing work? The principles behind the Tesla coil are relatively simple. Just keep in mind that electrical current is the flow of electrons, while the difference in electric potential (voltage) between two places is what pushes that current. Current is like water, and voltage is like a hill. A large voltage is a steep hill, down which a stream of electrons will flow. A small voltage is like a near-flat plain with almost no water flow. Photo modified from Los Alamos National Lab. 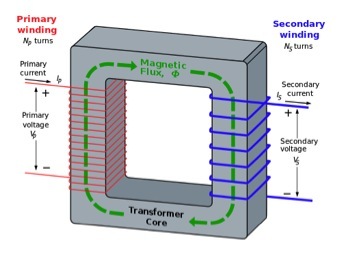 Similarly, if a magnetic field flows through the center of a coiled wire, a voltage is generated in the wire, which causes an electrical current to flow. This is exactly how a common alternating current (AC) electrical transformer, found in every home, works. The constantly fluctuating electric current flowing in from the power grid is wound through a series of turns around an iron ring to generate a magnetic field. Iron is magnetically permeable, so the magnetic field is almost entirely contained in the iron. The ring guides the magnetic field (in green below) around and through the center of the opposite coil of wire. The ratio of coils on one side to the other determines the change in voltage. To go from 120 V household wall voltage to, say, 20 V for use in a laptop power adapter, the output side of the coil will have 6 times fewer turns to cut the voltage to one sixth its original level. The Tesla coil requires one more thing: a capacitor to store charge and fire it all in one huge spark. The circuit of the coil contains a capacitor and a small hole called a spark gap. When the coil is turned on, electricity flows through the circuit and fills the capacitor with electrons, like a battery. This charge creates its own electric potential in the circuit, which tries to bridge across the spark gap. This can only happen when a very large amount of charge has built up in the capacitor. Eventually so much charge has accumulated that it breaks down the electrical neutrality of the air in the middle of the spark gap. The circuit closes for a fleeting second and a huge amount of current blasts out of the capacitor and through the coils. 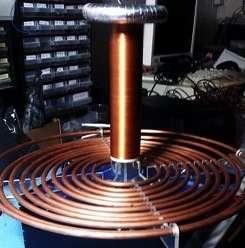 This produces a very strong magnetic field in the primary coil. 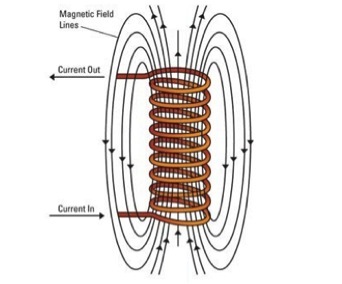 The secondary wire coil uses electromagnetic induction to convert this magnetic field to an electric potential so high that it can easily break apart the air molecules at its ends and push their electrons in wild arcs, producing enormous purple sparks. The dome on the top of the device acts to make the secondary coil of wires receive energy more fully from the first coil. With some careful mathematical calculations, the amount of electrical energy transferred can be maximized. Flying blue streamers of electrons flow off the coil and through the hot air searching for a conductive landing place. They heat the air and break it into a plasma of glowing ion filaments before dissipating into the air or surging into a nearby conductor. A tremendous light show is generated, as well as a loud buzzing, crackling sound, which can be used to play music. 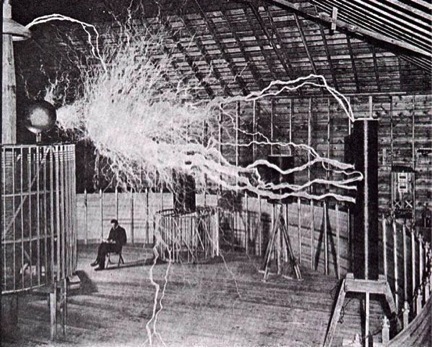 The electrical theatrics are so stunning that Tesla was known to use his device to scare and mesmerize visitors to his lab. Tesla might not have invented a death ray or free infinite power, but he did design a simple but brilliant machine to demonstrate the sheer power and beauty of electricity. Tom Hartsfield is a physics PhD candidate at the University of Texas.